Here are some helpful tips to help you enjoy your Scentsy Warmers. As a longtime Scentsy Independent Consultant/Director, sometimes I forget what it's like for our brand new Scentsy customers. I keep hearing questions such as, how long will my wax last? Where do I get more wax? How do I clean out my dish? Where can I buy another warmer? I see other wickless candles at the store, but the label doesn't say SCENTSY...Do they sell SCENTSY in stores? What about replacement bulbs? Here are some useful tips to help our new Scentsy customers thoroughly enjoy their new Scentsy products. Customers Love the Cordless, Battery Operated Warmers! We are pleased to announce, you can finally buy an authentic Scentsy battery powered warmer with no cord! The new warmers are small, light weight and you can place it anywhere in your home or office, no electrical outlet needed! The battery is rechargeable, just like your phone! See our recent battery powered warmer post to learn more. Where can I Purchase Authentic Scentsy Products? Scentsy is not available in stores, and can only be purchased through or from a Scentsy Independent Consultant. You might see a similar product in a store, but it's not Scentsy! Almost any experienced Scentsy customer will tell you, there's absolutely nothing on the market that can compare to Scentsy. The Scentsy warmers are wickless, flameless, safe, unique, well made, popular, and reasonably priced. They're available in multiple sizes and many different colors and designs. Also, there are over eighty different amazing fragrances. There's so much more, but the best way to find out more is to browse online. If you'd like, contact me directly. I'll help you purchase your Scentsy product and I'll make sure you get the very best value for your money. BE SURE TO ASK ME ABOUT MY PERSONAL SPECIALS! Call or text Mary Gregory at 661-210-7617. 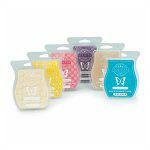 See All the Latest Scentsy Warmers and Scented Wax! How Much Wax Should Be Used in Scentsy Warmers? The amounts of wax will vary, depending on the size of the warmer and the size of your room. First, see your Scentsy Bar and notice each bar contains eight small cubes of scented wax. For the small night light warmers, you only need one cube at a time. Most people use the night light warmers in outlets located above counters or small rooms such as a bathroom. You only need to use one small cube at a time, and some people cut the cube and use half a cube at a time. For your mid size and full size warmers, we usually suggest two cubes at a time, at the most! Try one cube, then one and a half and see how it goes. Some fragrances are stronger than others, so it's best to experiment and see what works best. We Carry popular new Bath Bombs! Click or tap to see all fragrances! How long will my scented wax last? Sometimes our newer customers don't really understand how the scented wax works. First, the wax will not evaporate or dissipate. Each single cube of wax will continue to provide a fragrance for between 10 and 20 hours. If you put in two cubes or more, it will not last any longer, and that's why we suggest starting out with less. Once you put wax into the dish and warm it, the clock starts ticking. Also, the length of time will wary, depending on the fragrance. Some really do last longer than others. I've heard reports from my customers saying they actually got 40 to 50 hours off of one and a half cubes. This is amazing and is not the norm! One Scentsy bar contains eight cubes. If you get 15 hours out of each cube, a full Scentsy bar will yield 120 hours of fragrance. That's a heck of a deal, and much better than a candle! Click here to see and buy Scentsy Bars online. You can also call or text me and I'll help you choose. Mary 661-210-7617. I'm also very active on facebook and you can find my Scentsy Facebook page going to Facebook and searching facebook.com/meltawax. How do I change the wax without spilling, and how do I clean the dish? The answer depends on the warmer type. For the small night light warmer it's best to turn the warmer off and let the wax cool for a few minutes. Once the warmer is safe to touch and the wax starts to harden, simply unplug the warmer and empty the soft wax into a trash can, using a paper towel or tissue. Just wipe the dish with a towel and you're all set to put in a new cube of wax. For the larger table top warmers, it's much easier. It's still best to wait a few minutes for cooling. First, turn off the warmer and wait until it cools a bit. Once you can safely handle it, lift the dish from the top of the warmer and empty it into a trash can. Then, simply wipe the dish clean with a paper tower and you're all set. Place the dish back on the warmer and start your new wax warming. Examples of Various Scentsy Warmers. Shop Warmers Today! Also, we used to sell special "Grab Tabs" for the small night light warmers but those were not the best solution and are no longer available. Honestly, save your money, because the best way is to simply soak up the wax with a cotton ball or two. Then, use a paper towel or whatever you have to lift the cotton out of the small dish and place it in the garbage. Once you've removed enough wax from the dish by using the cotton, unplug the warmer and wipe the dish clean with a paper towel. You're all set to place your new scented wax melts into the clean dish. The 15 watt light bulbs for the small Scentsy night light warmers can be very difficult to find, but you can find the 20 watt mid size bulb, and the 25 watt full size bulb, almost anywhere. The small night light warmer bulbs are small bulbs, similar to the old time type of bulbs that were used on Christmas trees, but you need 15 watts! Most of the light bulbs that are shaped like the night light warmer light bulbs, are of a lower wattage. Do not waste your money buying a lower wattage replacement bulb. The bulb for your night light warmer MUST be the exact same size bulb that came with your warmer, but 15 Watts. The lower wattage bulbs will not keep your wax melted. These 15 watt bulbs in the size needed are tough to find. We suggest buying a couple of replacement bulbs the next time you buy more wax. Our Scentsy replacement light bulbs for the warmers in our home tend to last six months to a year. Just like any other light bulb in our home, we keep spares on hand so we always have one when we need it. Not Sure of Your Light Bulb Size? See the Sizing Chart here! 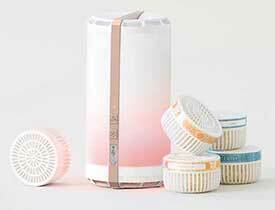 We carry many Scentsy replacement parts and accessories at our online store. We have many replacement dishes for your mid size or full size warmers, Scentsy replacement light bulbs in three sizes, warmer stands, and more. It rarely occurs, but if you break a dish for your mid or full size warmer, we most likely have a replacement. The warmer stands will enhance the look of any mid or full size warmer and are available in square and circle design. How to SAVE money when buying Scentsy? When it comes to saving money, this tip is probably the most important of all! To get the very best value for your money be sure to take advantage of our Scentsy Bundle deals. These deals are available 24/7 online in my shop. Our favorite deal is the 6 Scentsy Bars. Shop the combine and save deals and you will save money every time you buy! You can also contact me directly and ask about my specials. You never know when I have a special going on. You can always sign up for my newsletter to stay informed. The instructions below apply to our traditional larger tabletop warmers, NOT the small nightlights that plug in to a wall. Nowadays, some of our newer warmers have multiple parts and pieces which we'll cover later on in separate posts. Regardless, for the most part setting up a warmer is simple and self explanatory. Remove all the plastic and remove the light bulb from inside the warmer. Don't forget to remove the plastic from the bulb. When you're done with your warmer for the day, just turn off the switch. You can leave the wax in the dish, let it harden, and use it again next time. We hope we've provided you with the helpful tips to help you enjoy your Scentsy Warmers. We encourage you contact us directly or leave a comment and we will respond promptly. Do I have to unplug my large warmer every night or can I leave it turned on for several days at a time? I really like the smell in the house and I like to use the light as a night light for my family. Please respond via email as to I don’t get on this site normally. You can leave your large warmer plugged in as long as you want! Remember, many authentic Scentsy candle warmers double as a night light or small lamp and can be treated like any other lamp. Keep in mind though, the fragrance emitted from your warmer will only last so long, and that often depends on which scented wax fragrance you are using. Typically, my husband and I like to change our wax every 24 hours or so. That means, the longer you keep your warmer on, the sooner you’ll have to replace your light bulb. Also, just link any other lamp, the more you use it, the more often light bulbs will need to be replaced. Your comment comes at a good time for us to remind our visitors, the scented wax does not evaporate. We’ve had some customer’s contact us about how often they should replace their wax and the simple answer is, when your wax quits emitting that wonderful aromatic fragrance. Even though you can see the wax in the dish, if it’s been used for more than about 3 days, it’s probably time to replace the wax! BTW, the best way to SAVE when buying wax is to Combine and Save. You can get six Scentsy Bars for just $30, so it’s like getting one bar free! Click or tap here to take advantage of this great deal! We hope we’ve answered your question and encourage everyone to please leave their comments, and we’re happy to reply! How do I get red wax off my lace ceramic wall warmer. The outside of it. This is s tough one! I assume you’ve tried to just scratch at the spot while the wax is dry to see if the wax will crumble off on it’s own. If that didn’t work you might try warming up the spot of wax and blot the wax off with a paper towel. You could try using a blow dryer to heat the area. Be patient with this as you may have to go through the process repeatedly to get the job done. Once the wax is removed, you may need to dab it with rubbing alcohol. If it’s a very small spot, you may want to use a q-tip. I can’t remember if my warmer is a mid-size or full-size. It’s the leopard print style, but I’m not sure which bulb to buy and can’t find anything to reference from online. Do you know which size this style of warmer is? thank you! The Leopard Scentsy Warmer was a Deluxe Full Size Warmer and takes a 25 Watt Bulb. 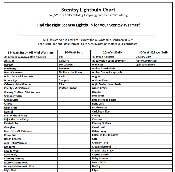 You can see for yourself the light bulb sizing chart here at our website. Here’s the link. Buy Lightbulbs! Just scroll down just below the light bulbs and you’ll see a tan colored box to click. It says “See the Light Bulb Sizing Chart to Confirm Your Size”. I really like that Leopard Warmer as well and I hope our information helps. Was cleaning my warmer, and apparently there was a leak somehow, now there is wax in the bulb socket. Am I able to clean it, or will have to get a new warmer? Wow Victoria! You are in a bit of a fix. The first thing you want to do is of course, is to unplug your warmer. I’ve actually never had this happen, but I’m thinking I would maybe try using my blow dryer to warm up the inside of the warmer. Then, try blotting the wax up with a paper towel. Fitting the paper towel down inside the socket might be tricky, so you may have to try experimenting with using a Q tip. I believe it could be done, and you should be able to avoid buying a new warmer. Good Luck and please come back and share your results! Freeze you warmer an wax comes out so easy. The freezing might work, but it’s quicker to use cotton balls. If it’s the type of warmer with no dish to remove, I usually use the cotton balls. If it’s a removable dish, I just empty into garbage. Yes! You can absolutely leave the lid on this particular warmer. Enjoy! I guess we missed replying your comment. My husband used Perfectly Pomegranate Scentsy Bar wax melts at his office and he get’s a crazy amount of long lasting fragrance. He uses about 1 1/2 cubes per week and is in his office about 50 hours per week. He says when he opens the door to his office on Friday mornings, he can still smell the scent he placed in the warmer on Monday morning. For me, when I melt about one cube every 20 to 30 hours. Some fragrances do last longer than others and you just have to experiment. I purchased a wax warmer from my granddaughter’s school sale. The bulb blew out and I do not know what size bulb to replace it with. I purchased a 25 watt bulb but that is too big and round. I’m betting your bulb size you need is 20 watts. There are only three possible light bulb sizes used for most Scentsy warmers. The largest is a 25 watt bulb and that bulb is round. Then, there’s another round bulb but it is 20 watts. The last bulb is only for the night light type warmers and that’s a cone shaped, 15 watt bulb. Again, that’s only for the small warmers that plug directly into a wall outlet. If you haven’t seen it yet, try having a look at our Scentsy replacement light bulb page and you’ll see the photos showing you different options. Oh, I almost forgot to tell you, there is one more Scentsy light bulb but it’s a 40 Watt Edison bulb. At this time, that bulb only works in one or two old time themed warmers. What is a strong Fragrance I cant smell mine. The Black Raspberry Vanilla Scentsy Bar is pretty strong, but there are plenty of others. Really, it’s a matter of personal taste. Only your nose, really knows!! Do I need to place a coaster under my warmer if it’s on a wooden surface? I do not think so because I have had my full sized Scenty warmer on a wooden dresser for a couple a months and there have been no marks or burns. Do I have to put a wax candle on my Candle Wax Warmer or can I use it just as a night light. I know the dish will get hot but would it burn if there is no candle on it? I’ve spent a small fortune on warmers and waxes also. I have two in my kitchen and two in my family room. I put two waxes of the same scent in each warmer but only really smell it the first day. My warmers are on opposite ends of each room with ceiling fans on and that doesn’t even help. I also have a plug in my my entryway that seems to disperse the smell pretty good. There’s a full size in my bedroom, which is a smaller room in comparison, and the best wax in there is Shimmer as well as Shimmer in my bathroom. That one REALLY smells great and LASTS. I have a plug in scentsy warmer and wonder why the plug in part can be turned so the ground plug is at the top? I have outlets that are “upside” down and the ground is at the top but my warmer will not operate in that position.What am I doing wrong? I am looking for a heating element replacement for my pineapple wax burner, I am hoping you can help me . Can you put essential oils directly on the warmer? I’m confused. I’m trying to use a trial sized Scentsy but I’m not sure exactly how. Can anyone help? Thanks so much for providing these tips. I purchased a warmer from you for a Christmas gift and my daughter loved it!